What Does Code P0448 Mean? Fuel volatility is an aspect of fuel with advantages and disadvantages. On the plus side, the better a fuel vaporizes the better it burns, which is why we burn gasoline and diesel in our vehicles instead of, say, wood or coal (though these can be used with sufficient processing). On the negative side, however, fuel vapors have been found to be harmful to the atmosphere and human health, so controlling those vapors is particularly important. 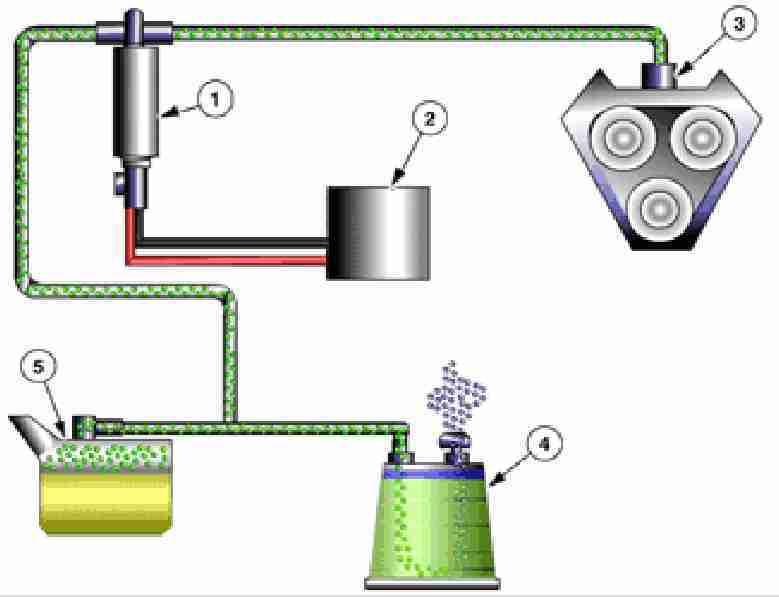 The evaporative emissions control system, typically referred to simply as the “EVAP” system, has been designed to prevent fuel vapors from escaping into the atmosphere. The EVAP system is essentially a network of tubing and valves designed to store and release fuel vapors at the right time without permitting them to get into the atmosphere. The EVAP system temporarily stores fuel vapors in an activated-charcoal canister until they can be burned. Under certain engine operating conditions, the EVAP system will open to the engine intake, and fuel vapors will be “purged” from the canister burn in the engine. The ECM (engine control module) uses pressure and voltage sensing and logical programming to control the EVAP system and to verify that it is sealing and venting when and where it should. In the case of the purge cycle, the ECM opens the purge valve and the vent control valve to allow engine intake vacuum to pull fuel vapors into the engine to be burned. The vent valve needs to be open to allow fresh air to flush out the charcoal canister, “cleaning” it of stored fuel vapors and making it ready for another charge. What are the common causes of code P0448 ? Depending on year, make, and model, DTC P0448 may have number of causes. Here are some of the most common. Always Check the Gas Cap! Loose Gas Cap or Refueling While Running – This is, by far, the most common problem encountered by the EVAP system. During refueling, the engine should not be running. The key can be in the OFF or ACC positions, but should not be in the ON or RUN positions. 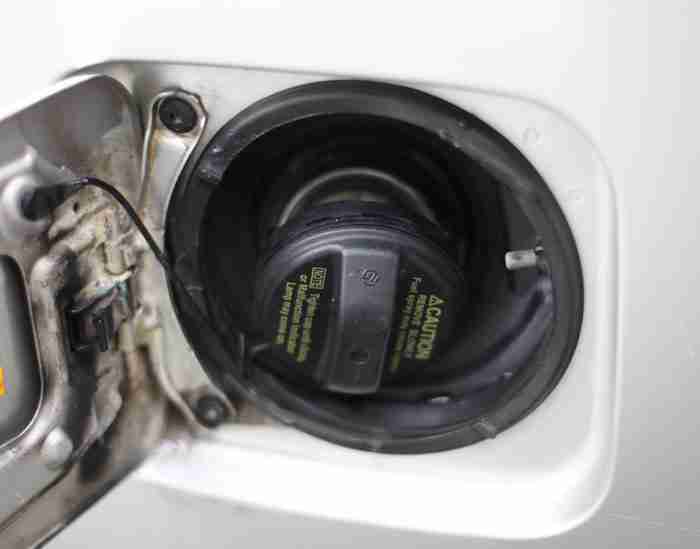 When refueling is completed, the gas cap should be reinstalled and torqued properly. Usually, this requires one or three clicks for proper sealing. Improper Gas Cap – Some aftermarket gas caps may physically fit, but may be incorrectly vented for your particular vehicle, which may also cause the MIL to illuminate and EVAP system DTCs to be stored. In this case, a new OEM (original equipment manufacturer) gas cap will solve the problem. Old Gas Cap or Other Damage – Poor sealing anywhere in the EVAP system can cause problems with EVAP function and monitoring. Be sure to check tubes, hoses, gas cap gasket, fuel fill tube, and charcoal canister for damage or cracks. General Motors – A number of TSBs (technical service bulletins) have been released addressing issues with clogged EVAP vents, usually vehicles operated in dusty and dirty environments. Relocating the vent hose to a cleaner or more protected location generally fixes the problem, though you may be able to get away with cleaning it yourself. Spiders – It seems that certain arachnids have a penchant for fuel vapors, even the few that escape the canister vent control valve. Building their nests in the vent line blocks the flow, some of them so bad that they cause EVAP DTCs to be set, including P0448, and some so bad that they’ve caused canisters and fuel tanks to crack. Mazda vehicles are notorious for this, resulting in multiple recalls and TSBs, but other vehicles have been found to suffer similar problems, such those made by Honda / Acura and Hyundai / Kia – all vehicles should be suspect, really. What are the symptoms of code P0448 ? In most cases, you will not notice any symptoms other than the MIL and slightly reduced engine performance and fuel economy, depending on whether the ECM goes into “limp-home” mode or not. If the EVAP vent control valve is stuck open, you may notice a fuel odor. This DTC may be accompanied by other EVAP system DTCs. How do you troubleshoot code P0448 ? Control circuit malfunctions, as suggested by the definition, are related to problems in the circuit. This may refer to the circuit in the sensor or actuator itself, but do not simply “replace the valve” because the DTC refers to the vent control valve circuit. The circuit problem can be anywhere between the ECM and the solenoid, including wiring, connectors, and the solenoid itself. For basic diagnostics, you will need a DMM (digital multimeter), electrical wiring diagram (EWD), and a vacuum pump and pressure gauge. Initial Checks – Logic-based ECM EVAP self-diagnostics require that the system be properly sealed and vented in all the right places. Electric-based EVAP self-diagnostics require that the system be intact electrically. Check that all EVAP hoses are connected properly and in good condition. Check wire harnesses for obvious damage, perhaps due to chafing, misrouting or impact. Check that electrical connectors are free of corrosion and that pins are straight and seated properly. Make sure the gas cap gasket is in good condition and the gas cap is properly seated – usually one or three clicks. At this point, you may be able to simply clear the codes and try to drive the vehicle again and see if the DTC comes back. If this DTC came up right after refueling, particularly if you refueled with the engine running or didn’t install the gas cap properly afterwards, you can just tighten the gas cap, clear DTCs and keep driving. If the gas cap gasket is dry, cracked, crushed or otherwise compromised, replace it. Check that the vent hose, which allows fresh air into the canister, is not blocked, clogged or crushed. If insufficient air enters during the purge cycle, it may trigger this DTC. Pressure Check – Using the vacuum pump (Mity-Vac or similar), disconnect the vent control valve from the charcoal canister. Attempt to draw a vacuum on the valve. It should hold vacuum for at least a minute without dropping. Use a 12 V jumper to open the valve. The valve should open and immediately release all vacuum. Repeat this test on the purge control valve. If the valve fails to hold vacuum when closed or fails to open when energized, replace the valve. Electrical Check – Check for resistance at the vent control valve. Most valve solenoid should measure between 30 Ω and 40 Ω, though some newer electronically-controlled valves may range between 2 Ω and 6 Ω. If resistance is as specified, 0 Ω or over 10 kΩ, replace the valve. If the valve works properly and is electrically sound, check the rest of the circuit between the ECM and the valve. Look for corrosion or short-circuits that would keep the system from operating properly. Nice post ! After looking a lot finally found a post that explains me something real. I have a 2011 frontier, constant codes, p0447 / p0448, I have checked / cleaned everything. Solenoid reads 59 ohms, last solenoid read 59 ohms. When I put 12vdc to the solenoid, it clicks (opens), but the circuit on the vehicle will not open it. 12.30 vdc on the white wire, but only 3 vdc on the green wire. I am assuming a relay changes the green to ground, but dealers have no listing for an “ecm relay”. Ideas?